So I’m in Beijing now! Crazy, right? I’ll be here for the entire quarter for study abroad. I flew into Beijing yesterday from Taipei, thus finishing my summer research. It’s been a crazy week, which is why I haven’t blogged in a while, but here’s what I’ve been up to. Sorry, this is going to be quite a long post because I’ve been quite busy, and now that I’m finished, I’m going to add in some reflections. Aug. 12 – Stayed home, didn’t do much. Aug. 13 – In the morning, I took the bus to Taoyuan High Speed Rail Station to take the high speed rail to Kaohsiung! 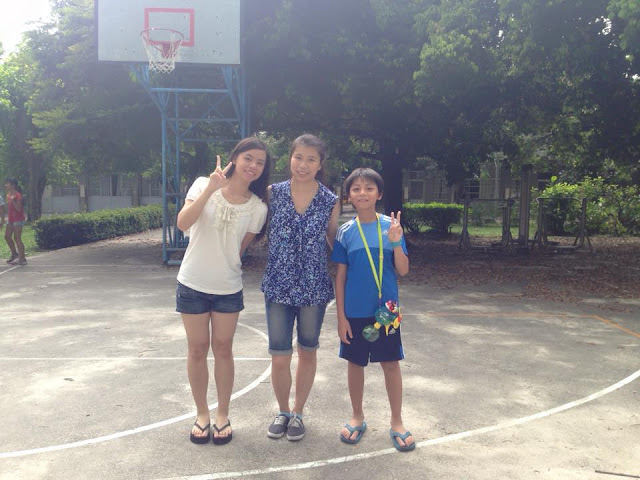 I went to visit my host family, who hosted me when I did a volunteer English teaching program in Taiwan three years ago. I got from Taoyuan to Kaohsiung in just an hour and a half. I wondered how the children have changed, and I spent most of the train ride sleeping. When I got to Kaohsiung, the last stop, Yu Mama (the name of the mom in the host family) picked me up, and it was so great to see her again! We drove to Neipu in Pingtung where her family lives, and on the ride there, we updated in each other about our lives. She updated me on her family and the school I worked at. I was able to spend the weekend with her and her two children, but the two other children I met during my stay, Kai Kai and Yo Yo (who are her niece and nephew) had moved away, so I wasn’t able to see them. We arrived at their house, and I saw the two kids, Jia Jia (she is now 16) and Shane (he is now 12). I was like, wow, they’re so old now! But at the same time, they look the same, except they grew. I mean well obviously, but that was my first thought when I saw them. And of course I was really happy. I only stayed with them two weeks, but I’ve had some of my best memories with their family. 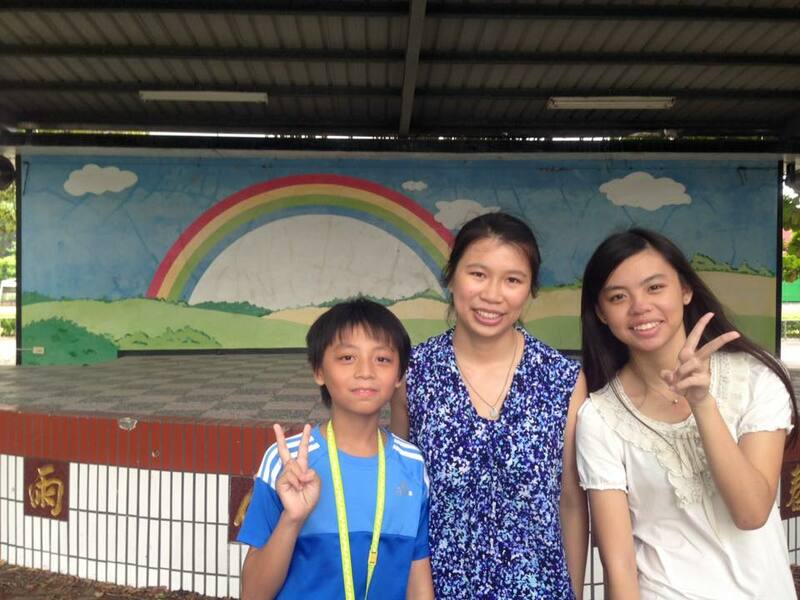 First, we visited Chung Wen Elementary School, which was the school I taught at. It was absolutely surreal seeing it again. And it was so empty! (Of course, it’s because it’s summer and classes haven’t started, but when we taught at their summer camp, it was full of kids and full of energy). I was secretly hoping I might see some of the kids I taught before, but I didn’t. I was also hoping to see one of the English teachers who worked with us, Christine. Maybe she would be in a summer teacher’s meeting or something. But she wasn’t. Anyway, the school looked exactly the same, from the trees to the rainbow mural to the basketball court to the quadrangle like building. We took some pictures at the school, and then left. Shane did the AID summer camp three years ago. I asked him if he did AID this year, and he said he was too old for it this year. I thought, oh right. But also, three years ago he absolutely refused to speak English. This time around, he would throw in some English phrases when he talked, like “Let’s go!” And he would ask how to say some words in English. I’m glad to see he’s more comfortable with it. We also stopped by their grandparents’ house, where I stayed three years ago. I greeted their grandparents and pet their new dog. They used to have talking birds (I don’t know what kind of birds they are), but they gave them away. We then ate lunch at the dumpling restaurant Yu Mama works at. We ate dumplings, wonton soup, noodles and hot and sour soup. We also bought bubble tea (which Taiwan is famous for). After lunch, we were off to Kenting! Kenting is on the coast. The ride there was a lot of fun, and the view was phenomenal, a sweeping view of mountains rolling into the ocean. Finally, we arrived at the hotel we were staying at, which is owned by 7-Eleven. 7-Eleven is a really big thing in Taiwan, and it even has mascots. The mascot of 7-Eleven is named Open. Don’t ask me why. We settled into our room and then went swimming. Afterwards, we ate dinner. At night we went to Kenting Da Jie, which is a street filled with food vendors, kind of like a night market. We got various snacks like a papaya shake, bubble tea, fried milk (it’s so good!). I also saw that it was very touristy. But touristy among Taiwanese and Chinese people. 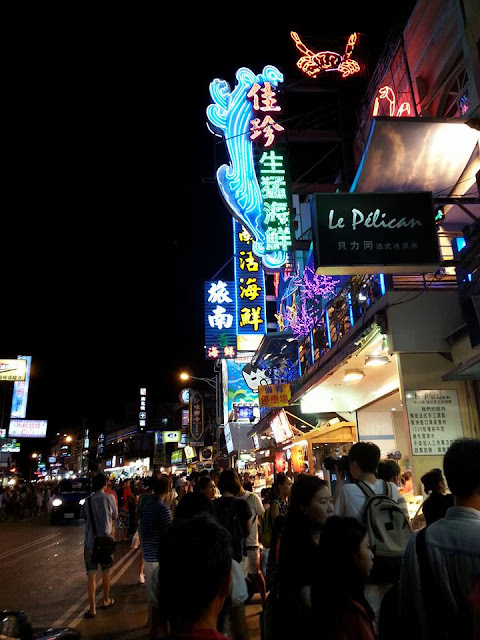 Like Taipei is very touristy, and I often see white tourists there, but Kenting is touristy for people from China and other parts of Taiwan, so there are a lot of bars and night clubs. A lot of people go to Kenting because of the coast, and as a result, it has become a touristy location. At night I introduced Jia Jia to Spotify. Apparently no one in Taiwan uses Spotify, which is weird to think about because I pretty much rely on Spotify for music. Aug. 14 – After breakfast, we did a lot of activities at the hotel, like archery, playing DDR and air hockey at the arcade and making arts and crafts. We painted a picture frame and a toy frog. Then we packed up and drove to the Kaohsiung High Speed Rail Station. There we said goodbye, and they said to visit again, and I think I started tearing up while walking up the stairs to the station. I really hope to see them again, whenever I go back to Taiwan. I took the high speed rail to Taichung to meet up with my grandma because we had planned to meet up with her friend Aunt Guan there (she’s the one that told our fortunes). When we met up with her, we went out for dinner and ate potstickers, peanut noodles and spicy dumplings. Aug. 15 – In the morning, my grandma and I visited Tunghai University, where my grandma used to live nearby. We visited her old neighbors and then we walked around the university. Sadly, many trees fell over from the typhoon, but there was one pathway that was beautiful, as it is lined on both sides with large trees. It started raining really hard though, and although we had umbrellas, we got pretty soaked, so we went to her old friend’s house to dry off. In the afternoon, my grandma, Aunt Guan and I went to a buffet, and it was crazy! (Yeah I’ve gone to two crazy buffets this time in Taiwan, but this one tops them both). There was sashimi, crabs, fresh fish, soups, clams, Peking duck and more. The cool thing about it is, each table has numbers, and if you want fresh grilled fish or clams or whatever, you put your number by the raw food you want, and they’ll cook it for you and bring it for you. I was so full, and I knocked out on the bus ride home to Zhongli. At night I went to church. Aug. 16 – In the morning, I took the bus to Hsinwu, which is in Taoyuan. I visited Hsinwu Catholic Church and went to Mass there, and afterwards I interviewed three people. Hsinwu has many Hakka people. One girl knew Hakka but said she wasn’t interested in learning more Hakka. One man said he identifies as Hakka but doesn’t know how to speak the language, but he wanted to learn some so he took a course in college. The third man I interviewed turned out not to be Hakka. He is actually a wai shen ren, which means both his parents are from China. However, he grew up in Hsinchu, which has many Hakka people. The interesting thing about the interview though was he has a very different perspective from everyone else I interviewed. He’s not as interested in language preservation, but he says that learning the Hakka culture should be more inclusive of everyone in Taiwan, since it often is just aimed at the Hakka people. 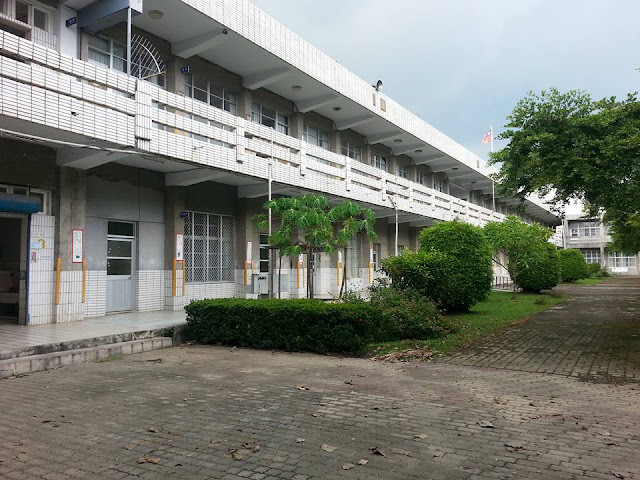 Aug. 17 – In the afternoon, I went to Miaoli. I think this day was an awesome day of interviews, which was great because it was my last. First I interviewed Yin Chang, a DJ at a Hakka radio station. Both her parents are journalists and opened the station, and Chang ended up working there. What’s interesting is that although she is Hakka and grew up in Miaoli, a Hakka speaking area, she did not know Hakka growing up. Also, she went to college in Australia and studied computer science, but she ended up working here because her parents wanted her to design a website for the station. Then, because of her outgoing personality, she started running a program. Since she didn’t know Hakka at the time, she did the late night Mandarin program, where she would play music, and people would call in to request music. She said that one night, a girl from New Zealand sent in a song she sang in Hakka, and Chang was touched that this girl had already been living in New Zealand for so long, but she still knew her mother language. From then on, Chang decided to learn the Hakka language, which she learned by studying for the Hakka language test, listening to Hakka music and practicing with her grandma. 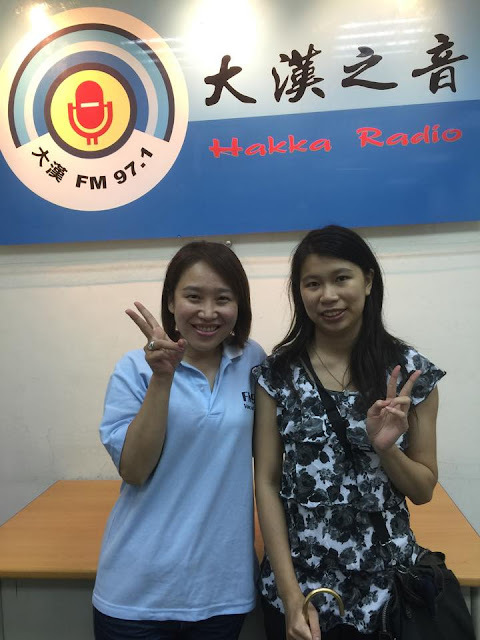 Now, she DJ’s a Hakka program, and she is passionate about promoting Hakka music. 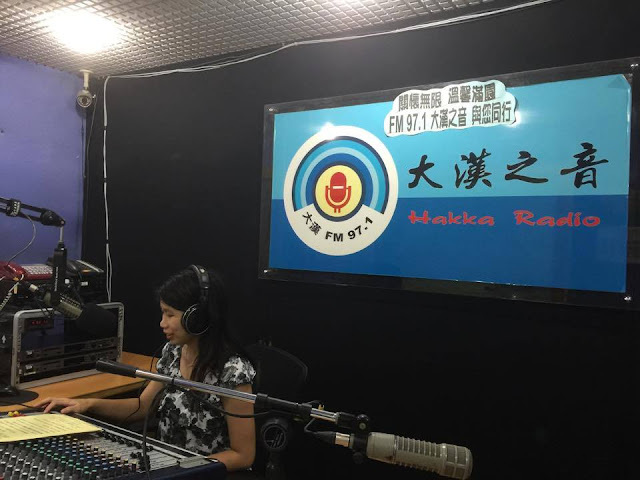 She also talked about the radio station, which promotes Hakka language and culture by teaching Hakka phrases, promoting Hakka music and music artists, using social media, and hosting events, such as Hakka cultural learning and radio broadcast camps for children and youth, and community service events to help Hakka people. Chang was such a pleasure to interview, and she showed me around the station and took pictures. Also, I got interviewed about my research by another journalist who works there, so I guess I’m famous now! The next person I interviewed also lived in Miaoli. He picked me up at Miaoli Station and took me to a Hakka restaurant, where we had dumplings and wonton. We also went to a shaved ice place for dessert. He is very passionate about promoting language culture, and he actually knew Chang because he listens to Hakka radio and goes to the events run by the radio station. He also went to a university in Pingtung, where there were many Hakka people, so he tries to use the language as much as possible with his friends, and he talked a lot about writing in Hakka. He hopes to go back to school one day to do a Hakka studies graduate program. Aug. 18 – I pretty much worked on stuff I needed to do all day, but for dinner my grandma and I went to a restaurant nearby, where we had taro rice noodles, shou zhua bing (a kind of flat bread that you can rip apart and eat with your hands) and bantiao. Aug. 19 – Today we went to Taipei and went to a homestyle restaurant owned by my grandma’s friend and met up with my grandma’s erhu teacher. Erhu is a Chinese instrument. We ate yam leaves with duck egg, spicy eggplants with ground pork, bamboo and more. Also, he cooked anchovies for me to take to China. I used to not really like anchovies that much. Like my mom would cook them with rice and I would eat it, but I didn’t love it. But I really liked them when coming to Taiwan. My grandma buys anchovies and cooks them with peanuts, and it’s delicious. This guy was even better at it. He cooked them with peanuts and hot chili peppers. So. freaking. good. After lunch, my grandma and I went to the almond tofu place we went to last time, and I had some. It was delicious and cool, especially since the weather was so hot. My last hurrah of Taipei. When we got home, I helped my grandma cleaned, and I packed my baggage. Aug. 20 – My grandma’s friend picked me and my grandma up to go the airport. There, we said goodbye. I’ll miss the food she cooks and our nightly walks. I will definitely keep in touch with her more (before, we talked to my grandma when my mom was talking to her). I’ve definitely bonded with her a lot over these past seven weeks, and I’m going to miss her so much! I flew from Taiwan to Hong Kong, and from Hong Kong to Beijing. Both flights were very smooth. The Taiwan airport is great, and it has themed lounges, like Hello Kitty, flowers and aviation. We arrived at Hong Kong earlier than planned. This is a first. I’ve never been on a plane that arrived earlier than expected. At Beijing, two of my parents’ friends, Fr. Niu and Grandma Liu picked me up. As we drove to Grandma Liu’s house, I was dizzy with excitement and trying to wrap my ahead around the fact that I was in Beijing and I was going to live here for the next four months. Grandma Liu invited many friends over for dinner, and we ate a lot of dumplings and drank a lot of Chinese beer. After they left, I showered, and I fell asleep almost immediately after a long day of travel. Aug. 21 – Today I moved in to Beijing Foreign Studies University, where I will be studying abroad! I moved into my dorm room. It’s really small. There is a bunk bed with a desk underneath, and a normal bed, as well as another desk, some wardrobes/drawers and a TV. I chose the bottom bed so I won’t have to climb up. After moving in, Fr. Niu took me on the subway, which was surprisingly really good and clean. Not quite as good as Taiwan’s, but way way way better than Chicago’s. We had lunch and ate these really delicious spicy beef noodles, and we also visited an old church, which I’ll be going to on Sundays. This university is pretty nice. There’s a track, a gym and a swimming pool, so I guess I’ll start working out again! There’s also a lot of universities nearby, so this area is like a college town. There are a lot of bars and small restaurants. There are also a lot of trees, and we’re right around the corner from the subway station. I’m really excited to be studying abroad here! So now that I’ve left Taiwan, I’d like to announce that I’ve officially completed my first long research project! I’ve interviewed 40 people, which included college students, young adults in the workforce, Hakka Affairs Council members, a DJ, a 90-year-old man, Hakka studies professors and more. I learned so much from meeting all these people and listening to their perspectives, and I also learned a lot about my own culture. Some were fluent in Hakka, some didn’t know any at all. Some grew up in the city, some grew up in Hakka language regions. Some had decided to dedicate their lives to learning about and promoting their culture. It’s very interesting to see how Taiwan has been promoting the Hakka culture, and how Hakka youth view preservation efforts. Some know nothing about these efforts and didn’t see any success coming out of them, while others are active in attending the Hakka Affairs Council events and watching and listening to Hakka media. Every Hakka young person I interviewed said the same thing, that they believed it was important to preserve the culture because it was a part of their identity, and it would be a pity if it was gone. However, their surroundings have a major influence in how they view cultural preservation. For those who grew up in Hakka language regions, the Hakka identity and language was just a normal part of their life. For those who grew up in urban areas, it was rare for them to know Hakka. Students who were not as interested in learning more about the Hakka language and culture differed depending on where they came from. If they came from Hakka language regions, it was because they did not see it as useful, but they knew about it because they grew up with it. For those from urban areas, it was because they had never come in contact with it. However, students who were interested in Hakka language and culture were quite passionate about it, especially the Hakka people are a minority and they are aware that the language and culture are quickly disappearing. They explore their culture by attending events, using the language as much as they can, using social media to learn more about the language, doing research and more. This was an important part of their identity, and they wanted to share it with others and make sure it does not go extinct. Those who grew up speaking Hakka were more likely to be interested in exploring and promoting their culture. If they grew up in a Hakka speaking region, it was because it was something they grew up with. If they grew up in an urban area, it was because they saw how the language and culture are quickly declining. I’ve typed my data on a spreadsheet, and I hope to write a story to pitch it to a publication. all the Hakka youth I interviewed – it was a pleasure to meet all of you and speak with you! From the bottom of my heart, thank you all so much!